Nestor entered the city center and approached the combat platform. Around the platform were numerous spears set into the ground. Lyaeus had made a name for himself by hurling his defeated victims down onto the spears. 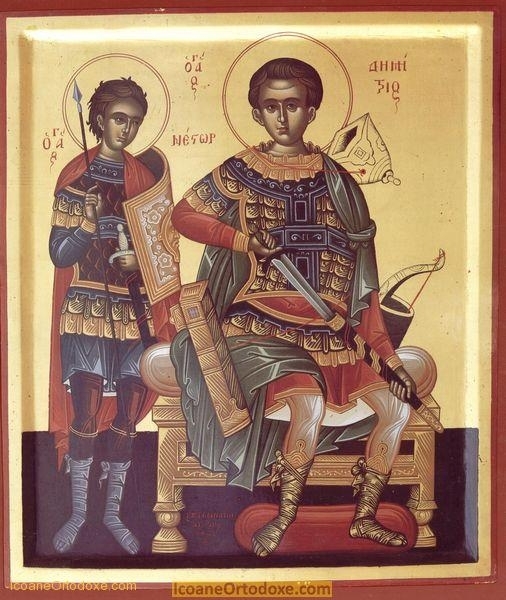 Soon afterwards, both Saints Demetrios and Nestor were put to death for their faith. Yet clearly they were not “afraid of those who kill the body, and after that have no more that they can do” (Lk. 12:4). They had “put on the full armor of God” (Eph. 6:11). They stood, girded their waists with truth, put on the breastplate of righteousness, shod their feet with the readiness of the gospel of peace, and took up the shield of faith, the helmet of salvation, and the sword of the Spirit. They were warriors of Christ and victors to the end. Being a warrior for Christ has no minimum age or athletic qualifications; the child-martyr Kyriacos was only three years old, but that’s another story. All warriors for Christ, however, must want to “be men” or “be manly” (1 Cor. 16:13). This doesn’t mean to be masculine (the term “manly” is used to describe female saints as often as male); it means to be what a human is really meant to be: brave, courageous, and authentic in obedience to God. When we are little, obedience to our parents teaches us how to obey. As “men,” adults, we put that ability into action in our relationship with God. Obeying God is manly; it’s what authentically mature humans do. And that obedience leads us to a courageous and brave Christian existence. It leads us on the way of being warriors for the heavenly kingdom, where we vanquish, by the power of Christ, “principalities, powers, the rulers of the darkness of this age, and spiritual hosts of wickedness in the heavenly places.” Spiritual battle is the life, and the identity, of the Christian warrior, the grown-up Christian. Through the prayers of the holy warriors Demetrios and Nestor!